Sermon for Pentecost 12: "Who is Jesus?" Identity is one of the buzzwords of our day. Businesses and institutions promote their identity to consumers. Identity politics runs wild on both sides of the political aisle. Many of us have online identities of our real selves on social media. Still, many others self-identify as something or someone else they desire to be. In many ways society is going through a collective identity crisis. Who am I? Who are you? Who are we? And the more the world continues its death spiral, the more often we, the body of Christ, his baptized people, find ourselves asking similar questions. What is the Church’s identity? But if we are to know our identity as Christ’s bride, the Church, we must first know the identity of our bridegroom Jesus. If we look to ourselves for answers, we’ll only come up empty, but if we look to Jesus crucified and risen…as St. Paul says, all God’s promises find their yes in Jesus. Who do people say that the Son of Man is? If you walked around Jerusalem, conducting one of those late-night talk show “Man on the Street” style interviews, you’d have plenty of material. The disciples’ initial answer to this question reminds me of that old joke about opinions and peoples’ noses. Everybody has one. The rabbis of Jesus’ day would say that the “son of man” is a mysterious figure in the Old Testament; some say it’s just another name for human being, while others say it’s a more Messianic title. In the general population, answers would vary even more. Some thought the Son of Man was a great prophet like Jeremiah, Isaiah, or John the Baptist come back from the dead; others thought the Son of Man was a priestly figure, a new Moses or Aaron. Still, others looked at the Son of Man like royalty: Hosanna to the King of David! If we asked Jesus’ question today, many would answer: “Well, he’s a moral example, an obedient Jew, a miracle worker, an exorcist, a wise teacher, a liar, a lunatic.” Some have even made the ridiculous distinction between the Jesus of history - the carpenter rabbi who was crucified - and the Christ of faith, the guy the church made up. But that’s rubbish. As St. Paul writes in 1 Corinthians, if Christ is not crucified and risen from the dead, then we are of all people most to be pitied. The “historic Jesus” is the “Christ of faith.” They are one and the same. If you think about it, a person’s answer to this question will tell you a lot about what they believe (or what they don’t); it’ll tell you a lot about where their faith, hope, and trust are grounded. Jesus’ question confronts the disciples with the very essence of the Christian faith. Who is Jesus? Is Jesus just another moral teacher or is he, as he claims, the Son of God come in human flesh to save us from sin and death? Think about it another way…if you’re drowning in the middle of the ocean, do you need Olympic gold medal swimmer, Michael Phelps, to give you some tips on how to swim a better butterfly stroke? No. You need a big orange Coast Guard helicopter to drop a rescue swimmer, and save you. So, in this world of guilt and shame, sin and death, do you need a life-coach, a guru, or a guide to show you how to save yourself? No. You need Jesus who was conceived by the Holy Spirit, born of the Virgin Mary, suffered under Pontius Pilate, was crucified, died, and was buried for you. We need rescue. We need the real Jesus that Peter confesses to save us from our real sin and death. Though he doesn’t know the full weight of his words, nor understand entirely what Jesus is doing until after his death and resurrection, Peter makes a faithful confession. And Peter says a lot in this short confession. You are the Christ. You are God’s anointed, his chosen One. You are the Messiah, foretold by the prophets. You are the fulfillment of all God’s promises in the Old Testament for his people Israel and for the world. You are like Moses and the prophets, but greater, for you are the One, true Mediator between God and man. You are the Word of God made flesh, the Son of the living God. You are like Aaron the priest, only greater, for you yourself will be the sacrificial Lamb of God who takes away the sin of the world. You are like David the king, only greater, for you will reign forever as King of kings from your throne on the cross to the throne room of heaven. And like all of God’s servants in the Old Testament – the prophet Moses, Aaron the priest, and King David – Jesus is God’s anointed. And this means Jesus is anointed to for a purpose. Peter not only confesses Jesus’ identity – that he is true God and Man – but also that Jesus has come to reveal what the Christ must do, for Peter and for all. To die and rise again for Peter, for you, and for all. This makes Peter’s confession our confession too. “To confess” means to say back what you have heard, to say the same thing. So, we confess our sins – saying what God says about our sins is true. We confess the Creeds – saying for ourselves and our neighbor what the Scripture teaches and what we believe, teach, and confess as Christians. We confess in our hymns, prayers, bible studies, and preschool, and everything we do in this church and school – Jesus crucified for you. And confession is always God’s gift, just as it was for Peter. Peter didn’t come to this conclusion by his own reason or strength. Jesus declared, Blessed are you Simon bar Jonah, for flesh and blood has not revealed this to you, but my Father who is in heaven. We say the same thing in the Small Catechism: I believe that I cannot by my own reason or strength believe in Jesus Christ my Lord or come to Him. But the Holy Spirit has called me by the Gospel, enlightened me with his gifts, sanctified me in the one true faith. But we don’t always confess this do we? No. We do the opposite. We deny. We deny Christ both with our lips and with our lives. With our lives by our attempts to justify ourselves, to be Christ for ourselves, to live as though God did not matter and as if all that mattered was Me. We deny Christ with our lips when we refuse to sing His praise, to confess His Name, to pray, praise and give thanks for what He has won for us. When our worship and prayers falter. We deny Christ in our thoughts, words and deeds. For these, and for all our sins, we need Peter’s confession. After all, Peter’s confession wasn’t for Peter alone, but for the whole Christian church, for you. On this rock I will build my church, and the gates of hell shall not prevail against it. Peter’s confession, like his later work as an apostle and the letters he wrote, points us to Jesus, the foundation of our confession and Peter’s. Jesus, our Savior, Redeemer, the Christ, the Son of the Living God. Jesus is crucified and not once does he deny us, but takes all our denial, and Peter’s, along with him to the cross. Jesus, the Christ is anointed to be our sacrifice for sin, so that we would be chosen and called children of God in his cross, through our Baptism into his death and resurrection. Jesus is enthroned on the cross for us so that his kingdom would come to us in his saving word, his comforting absolution, and his healing body and blood. These words, this saving message gives you a new identity. No longer are you a son of Adam or a daughter of Eve, but you are God’s own baptized child. No longer does God look at you and see denial, sin, and death...no, in Jesus, the Father sees the blood of his only Son, shed for you. Jesus’ crucified is the key that opens paradise for you, and for all. This is your identity: baptized, redeemed, and beloved by our Lord. Sermon for Pentecost 10: "The Divine Drama"
If you’ve ever been to see a play – perhaps at the Gem Theater – there’s a familiar pattern. The scene is set in the beginning – like Dorothy in Kansas. The following acts and scenes lead the audience to the finale – a romantic tragedy like Romeo and Juliet or a joyous ending like Beauty and the Beast. 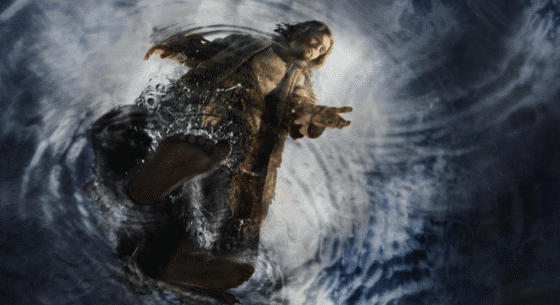 In many ways, Matthew’s account of Jesus walking on the water is like a well-crafted drama. But unlike the stories we enjoy at the theater or read about in books, the divine drama happened, not in a galaxy far far away, but in the playhouse of human history. All the world’s a stage, and in Jesus, the playwright became entered his own play to save man from the great tragedy of sin and death. And so, Matthew’s purpose isn’t entertainment or to teach a moral lesson. Rather, Matthew reveals who Jesus is and what he has come to do: to save sinners incapable of saving ourselves. Matthew wants us to see how utterly foolish, weak, and dead in sin we are so that in Jesus crucified we might see the fullness of God’s glory, his boundless grace and mercy to save even us. Already Matthew has introduced the plot and direction of this event. It begins with separation and distance – Jesus on the mountain and his disciples in the boat on the sea – and it will end with nearness and worship. Meanwhile, the disciples row, row, row their boat wearily in the sea. Exhausted. Fatigued. Then afraid. Around the “fourth watch of the night” (3 AM our time), they see a figure walking on the water towards them. Now, the disciples were sane and rational men. Four of them were experienced fishermen, not the type to scare easy. They knew that men don’t walk on water. “It is a ghost!” they cried out in fear. Can you blame them? Alone in a boat. In a storm. With a strange figure walking towards them on the water. Who of us wouldn’t be afraid? Well, seeing isn’t believing, but hearing is. As the apostle Paul reminds us, “faith comes by hearing the word of Christ.” Take heart. It is I. Do not be afraid. This isn’t Jesus saying, “Hey you guys! It’s me, chill.” No, these are important, often lost in translation. When Jesus says It is I, he’s saying Ego eimi in Greek. Jesus uses the divine name of YHWH. I AM. The one who appeared to Moses in the burning bush. I AM who I AM. Jesus is saying, “Have courage. I AM the Lord. Don’t be afraid. And he says it immediately. Take heart. I AM the Lord. Do not be afraid. YHWH in human flesh – whom the wind and waves obey – is Jesus, their Master. In his reassuring word, Jesus gave them everything they needed. Jesus’ Word is enough. That’s something the church today needs to hear as well. Jesus’ Word is enough. Jesus’ Word and promise in Holy Baptism. Jesus’ liberating verdict of forgiveness in Holy Absolution. Jesus’ presence and salvation in his body and blood. Jesus’ Word is enough. What would it take for Peter to believe? Headstands on water? Surfing without a board? No. Jesus’ Word is enough. What does it take for us to trust Jesus’ Word? A church where all the pews are full and the offering plates are spilling over? A bank account full of money and a house full of stuff? A healthy body, good self-esteem, and a perfect spiritual life? 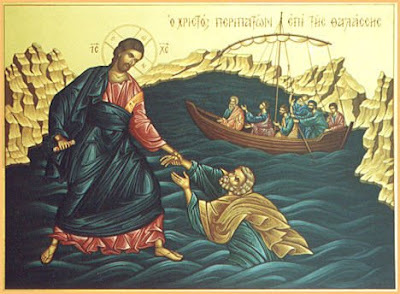 So, when Jesus says to Peter “Come” that’s all it takes to bring him out of the boat and walk to Jesus on the surface of the deep. The sea is a personification of Death, the abyss. In Israel, fishermen feared the sea. The sea was full of the great sea monsters, the Leviathan. It was a picture of death that swallowed you up whole and didn’t spit you out again. So when Jesus walks on the water, He shows not only His lordship over creation but also His lordship over Death. “Come.” Jesus said. That one word carried Peter from the boat, across the water, to Jesus. Now don’t try this in your swimming pool or down at Bolsa Chica. We don’t have that word from Jesus. But you have a better word spoken in your Baptism. Justified. Declared righteous before God. Forgiven. Holy. Jesus word does what he says. You don’t walk on water, you live in the water of your Baptism. Drowned in forgiveness. And raised to new life. Jesus’ word in your Baptism is as sure as the word that propelled Peter out of the boat to Jesus across the choppy Sea of Galilee. And there was Peter, standing next to Jesus, defying everything that Archimedes ever said about floating objects. He looked around at the white caps, and heard the wind. He was afraid. He started to sink. The first time Peter doubted whether it was really Jesus; this time he doubted whether Jesus could do what he said. This is what happens when we turn away from God’s Word. We sink into Death. Keep your eyes fixed on Jesus. That’s where Peter’s eyes needed to be – on Jesus. Not the wind, waves, or boat. Jesus. Nothing but Jesus. Same for us. Look at the world around us, inside yourself, and doubts will rise, fear will grow, and we’ll sink like a stone. That’s why we’re here every Sunday to hear the Word, to receive the Supper. Life is full of countless distractions. Sinking doubts. Paralyzing fears. The folly of our sin. When we lose sight of Jesus in His Word, His Supper, in the gathering in His Name, then we drown. We drown in despair, in guilt, in fear. We drown in our doubts, our skepticism, our failings and weaknesses. We drown in Sin and Death. Lord, save me. That’s all Peter could say… That’s the best thing he could’ve said. That’s all we can say too. Lord, save me. And he does. Immediately, Jesus reached out His hand and took hold of Peter. Whose grip matters the most? Jesus’ hands. The hands that pull you out of the abyss of the grave by being pierced and crucified for you. Jesus does rebuke Peter, but gently. Oh you of little faith, why did you doubt? We’re no different than Peter. We’re doubt, despair, and are afraid. Does God’s Word really work? If Jesus is Lord over the wind and sea, will he save me when I call upon him? What if I doubt or despair and have little faith like Peter? What if my faith isn’t even the size of a mustard seed? Will let me sink and give me what I deserve? No he won’t give us what we deserve; it’s the other way around. Jesus gives us what we don’t deserve: Jesus saves you, like Peter, by grace. You see, Peter’s faith isn’t given as an example to follow but rather to show that he is weak and sinful like us, so that Jesus’ identity and his grace and mercy are seen more clearly. And now, the story that began in separation and distance ends in nearness and worship. The disciples worshiped Jesus. Truly you are the Son of God. Jesus would not let the disciples sink or Peter drown. Jesus won’t let you drown either. Take heart. It is I AM. Do not be afraid. Jesus comes to us in the fourth watch of our day, when we are weakest. When we can’t pull our oars any longer. When the depths of Death overwhelm us. And He speaks a sure and powerful Word to us: Forgiven. You are God’s own beloved child. You stand justified before God’s judgment seat because He says so. The same Word who caused Peter to walk on the water will raise you up to dance on Death and the grave. You can count on it. You have Jesus’ Word; and that’s enough.